Become a monthly member and help Vital Ground protect habitat and prevent conflicts! 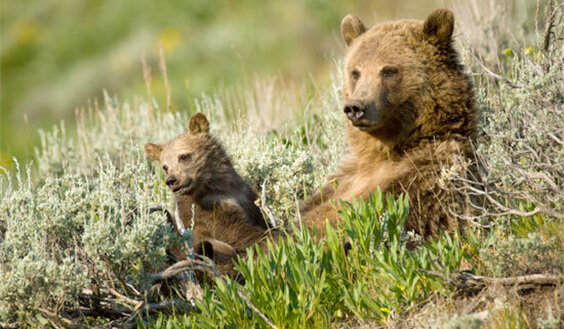 Your recurring gift sustains our work to save, connect and restore the right places for grizzlies and other wildlife and create bear-aware communities through local partnerships. Become a member today and you’ll receive a Vital Ground tote bag and bumper sticker as thanks! Email me with updates on Vital Ground's work, and let me know about other ways I can help protect grizzly habitat. I'd like to go paperless! If you choose to go paperless, we won't send you any paper mailings. You'll save paper and postage, making sure that more of your donation goes straight to our programs! Your donation will renew automatically, and you may adjust your donation amount or cancel at any time. Click the "Setup Donation" button below to setup your recurring donation via PayPal. Clicking this button will take you to the PayPal website where you'll need to login in order to setup this type of donation. This helps PayPal keep track and process this donation monthly. If you need to cancel your recurring donation, you complete this through PayPal and not through Vital Ground. Sustained contributions ensure a lasting conservation legacy. You’ll be a part of the grizzly bear’s ongoing recovery in the Northern Rockies, while also protecting countless other wild species, from Canada lynx to bull trout to rare wildflowers. Recurring gifts save time and other resources, keeping us focused on our land conservation and conflict-prevention goals, the heart of Vital Ground’s mission. Monthly donations improve Vital Ground’s long-term planning, helping us clearly chart our path as conservation leaders. Recurring contributions are efficient. You set it up once and we only ask once! Your donation is made through our secure website and PayPal processor. If you are having difficulty completing your donation online, please call 406-549-8650 or email info@vitalground.org.